While the Mainstream Media and Financial Network hacks delude Americans into believing the Fed and U.S. Treasury are in control of the financial and economic system, investors continue on a record eight-year buying spree of silver. This multi-year silver buying trend is unprecedented in history. Total new silver supplies fell far short of meeting these requirements. From 1971 through 1978 there was a cumulative deficit of new supply over demand of 415.8 million ounces. The silver that filled this gap came from the 620.5 million ounces of silver inventories – many held by investors – built up during the previous seven years. By becoming net sellers of silver, investors replaced the U.S. Treasury as the source of silver to make up for a major, ongoing shortage of silver. So, the price of silver rose from $1.5 to over $5 even though 620.5 million oz (Moz) were supplied from inventory stockpiles during 1971-1978… mainly from investors. The main drivers behind the price rise were skyrocketing oil prices and large buying by the Hunt Brothers and other institutions. In late 1982 investor interest in silver was rekindled by several forces, all of which emerged at roughly the same time. The international financial market panic led some investors to turn to silver. Others were attracted by what they saw as unsustainably low prices. Investment demand also was encouraged by a rapid easing of credit market conditions by monetary authorities in most industrialized nations; this easing led to an immediate revival of inflation fears. As a result of all of these forces coming to bear at once, investment demand picked up during the second half of 1982 and the first quarter of 1983. This influx of investor buying helped take silver prices from the June 1982 low of $4.98 to a peak of $14.72 in March 1983. Here we can see, that when investors returned back into the silver market, the price of silver increased from $4.98 in June 1982 to a high of $14.72 in March 1983. 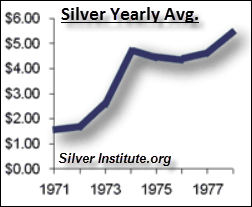 The difference in the 1982-1983 silver buying trend compared to the previous decade (1971-1978), is that the public was the main driving force in silver demand, while large individual buyers (Hunt Brothers & etc) were the dominant players. 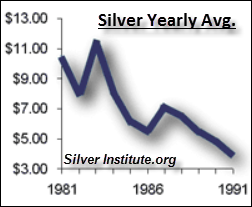 Furthermore, the public’s buying of physical silver during this time occurred during brief periods (1979-1980 & 1982-1983). This is much different from the current trend that started in 2008…. the year the U.S. banking industry died. Total Silver Bar & Coin demand in 2007 was 51.2 Moz. This picked up significantly in 2008 to 187.3 Moz and remained elevated for the next seven years. Silver Bar & Coin demand hit a record 243.6 Moz in 2013, due to low prices, declined in 2014 to 196 Moz, but will likely jump substantially in 2015 to over 240 Moz. 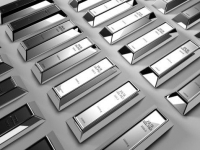 Investors purchased a stunning 1.2 billion ounces of silver from 2008 to 2013. 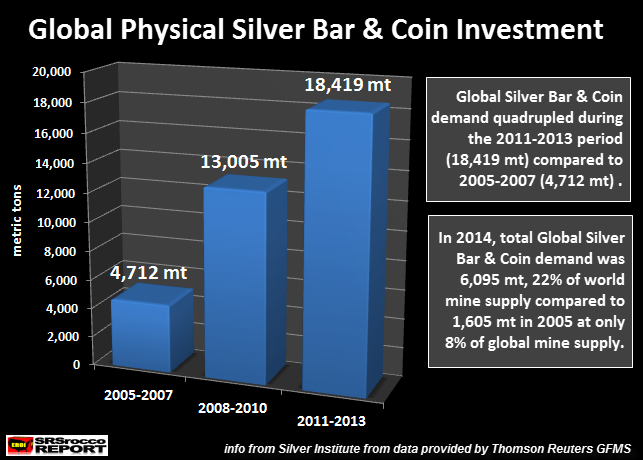 Of the 1.2 billion oz in Silver Bar & Coin demand, Official Coin sales accounted for 657 Moz or 55% of the total. 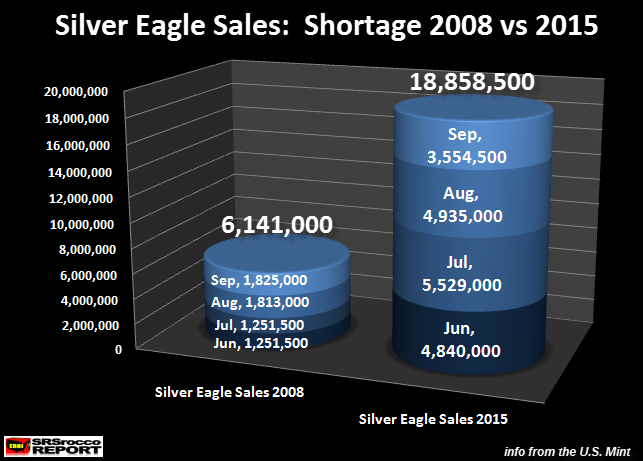 The Silver Eagle shortage in 2008 started in June after the price peaked in March at $21 due to the bankruptcy of Bear Stearns. Even though the price of silver declined until October after a hitting second peak in July 2008 of $19, investors continued to purchase record amounts of silver. This caused more retail shortages, thus pushing premiums to extremely high levels. Interestingly, the same jump in Silver Eagle buying also took place in June this year due to the possible Greek Exit of the European Union and the Chinese market crash. Although, the amount of Silver Eagle buying of 18.8 Moz (Jun-Jul-Aug-Sep 2015) was more than three-times the 2008 period of 6.1 Moz. Thus, the silver product shortages are taking place even with three-times the silver product supply. This is an important factor to understand. While silver product shortages are taking place, they are not yet widespread. So, for all the precious metal investors who like to leave comments on various blogs that they could buy 30 Silver Eagles on Ebay with no wait, or from another dealer with with only a week or two delivery time… there are still shortages taking place in many areas in the retail market. Short-sighted investors need to realize that country, or worldwide shortages don’t happen overnight. They start in certain areas and move throughout the system. If financial and economic conditions deteriorate by the end of 2015 and into 2016, silver product shortages will only get worse. Which means, we could see retail product shortages extend into the wholesale 1,000 oz bar market. The present eight-year silver buying trend by the public signifies a much different situation than what took place during the 1979-1980 and 1982-83 periods. Investors bought record amounts of physical silver during the 2008-2011 price rise period and even more during the price decline period from 2012-2015. Investment demand 1981-early 1982 and 1984 and onward, declined as the price of silver fell. However, the 2012-2015 silver price decline period will actually show an increase in buying (817.6 Moz estimated) compared to the price-rise period (2008-2011) of 628.5 Moz. Thus, the present silver buying trend is unprecedented. Why? It’s taking place during a four-year price decline period while the previous surges occurred as prices spiked or increased (1979-1980, 1982-1983 & 2008-2011). I believe investors are still buying silver even though the price has continued to fall because they realize the GREAT FINANCIAL COLLAPSE is still coming. Furthermore, the highly leveraged debt-based financial system is taking place as the world peaks in global oil production. 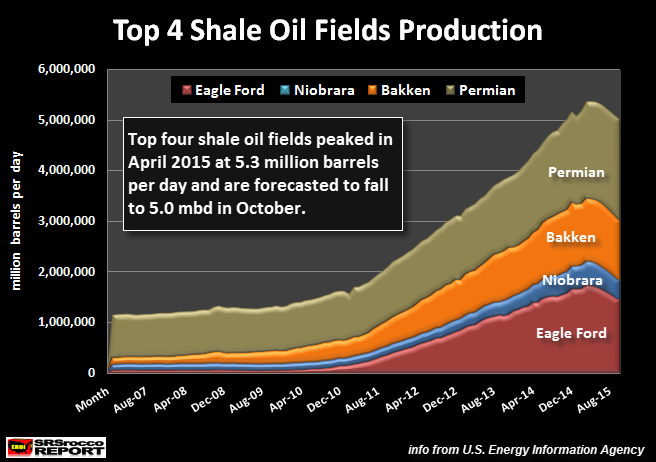 A perfect example of this forecasted rapid decline is U.S. Shale oil production. 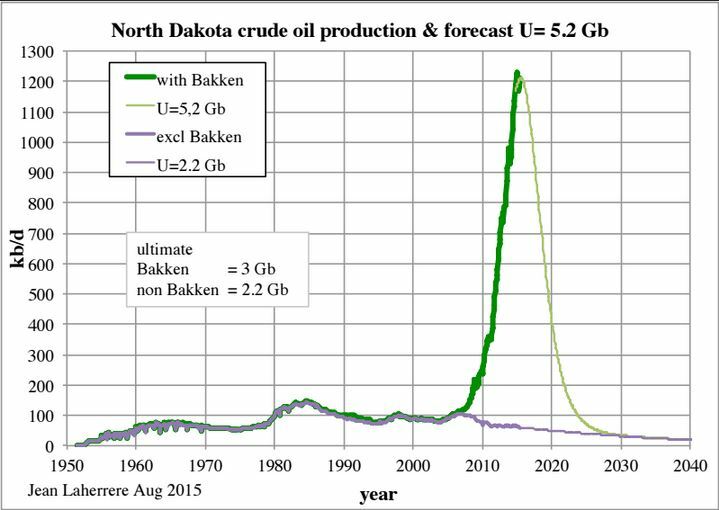 The GREEN LINE in the chart represents Bakken oil production (inside North Dakota, as small percentage is from Montana), while the purple line denotes the rest of North Dakota. 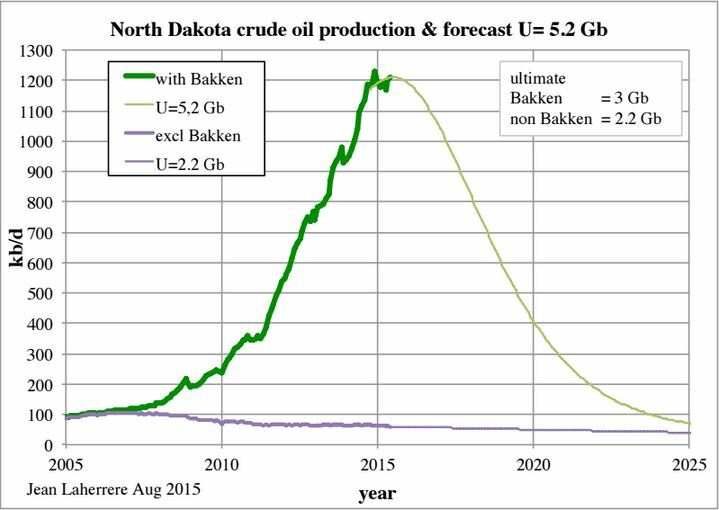 As you can see, Jean’s chart shows Bakken oil production peaking and falling to 400,000 barrels per day (bd) by 2020 and less than 100,000 bd by 2025. This is a huge drop from the 1.2 mbd of oil the Bakken is producing currently. If we assume the same kind of declines in the Eagle Ford and other shale oil fields, U.S. domestic oil production will likely fall 30-40% by 2020 and 60-70% by 2025. This will be the nail that finally destroys the U.S. Empire and economy. Unfortunately, there are still many analysts and investors who are completely clueless to the coming energy crisis. I still receive countless emails from readers informing me that there are trillions of barrels of oil still out there in LaLa Land or there are new energy technologies that will solve all our problems. Actually, I wish this was true, but it isn’t. This sort of wishful thinking takes place because individuals do not want to face the reality…. a reality that is just too damn horrible to swallow. So, instead of facing reality, many continue dream of SUGAR PLUMS DANCING IN THEIR HEADS. As precious metal analysts-investors bicker about whether THIS IS A SILVER SHORTAGE or not, the U.S. and world move closer to the worst collapse in human history. This is actually much worse than musicians playing music on the Titanic as it sinks. Why? There were 713 survivors on the Titanic of the total 2,229 passengers and crew. Thus, 32% survived the sinking of the Titanic, whereas only 1-2% of investors have gold and silver lifeboats.